Set up originally in 1732 by New Garden Monthly as Leacock Preparative, this meeting had operated as an indulged meeting under Sadsbury Preparative since 1728, form the home of Hattill Varman in Leacock township. When Sadsbury Monthly Meeting was established in 1737, this meeting became a part of it. In 1748, the meeting requested that it be allowed to move to Bird-in-Hand and in 1749, two and a half acres of land were purchased from John McNab and Joseph Steer. In 1751, the meeting's name was changed to Lampeter Preparative to relect the new location. 1790 a red brick meetinghouse was built to replace the original log structure. At the time of the Separation, the meetinghouse and graveyard were retained byt he Hicksite branch, which was laid down in 1851 and its remaining members transferred to Sadsbury Monthly. 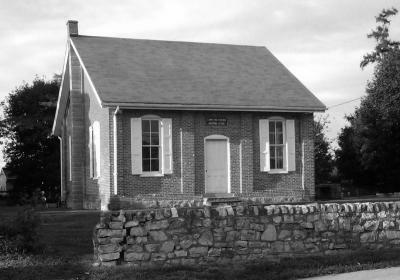 The meetinghouse is located on Rte 340 in Bird-In-Hand, opposite of Lynwood Rd.